Plant viruses are the most infectious agents in commercially important crops worldwide. Plant viral diseases are important because both decreased yielding and quality of fruits, flowers or vegetables lead to million-dollar losses in production. At present there are no reports which suggest a direct control of plant virus. A new strategy for plant virus control has been raised since 13 years ago—the use of peptides. Peptides could offer a direct interaction by affinity selection against viral proteins involved in infection cycle, like capsid or movement protein (e.g.) and affect viral replication. Peptidomics, as a new tool to study peptides, led us screening and selecting the best peptide with antiviral activity, and re-designing it to enhance the biological effect as well as the potential of bioactivity of those peptides secreted by microbes present in soil. 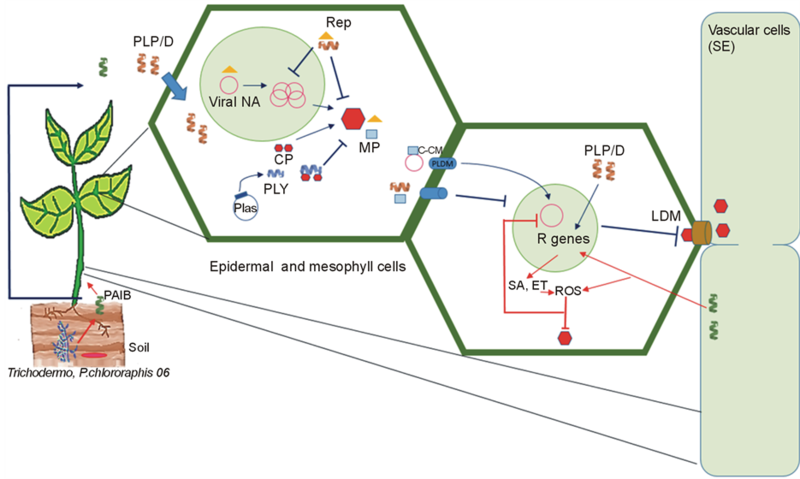 In this paper we review current aspects in the use of peptides and peptidomics as a strategy to study new methods that lead a direct control against plant viral diseases. Plant diseases are known since men started cropping in ancient times, but concepts about them have been passed through large and continued evolutionary process change in more than 20 centuries. Greeks philosophers as Teofrasto, talked about disease in cultures and they supposed possible origin and some treatments  . Commercially important crops such as vegetables, ornamental plants, grasses and cereals are not free to get infections which decrease their yielding and production. One of the main etiologies in plant diseases is caused by viruses; these agents are responsible for high lost in yielding and quality in crops worldwide. These losses are variable year to year, and have been in function of weather, crop management, chemical and cultural control of vectors (insects) and weeds, and in some case reached 100% losses  . Pathogens plant viruses are small pathogens and depend on the replication host machinery to replicate and generate progeny  . Plant viruses are classified based on features of nomenclature and taxonomy described by International Committee for Taxonomy of Viruses (ICTV)  . Currently, there are 2828 species of plant viruses that belong to 455 genera  . Frequency of these infections has been increased in most agricultural areas worldwide, pointing the theme of the more important affection in crops. To get control in any disease, it is relevant to know the etiological agent based on identification through miscellaneous laboratory methods, which leads us searching for handling and control of disease. Accurate diagnosis of the viral agent is a determinate factor in developing control alternatives  . A strategy to control plant virus is the use of plant resistance genes (R) to viral infection, natural or modified by genetic engineering. If there are R genes over expressed in natural way, these could come into other cultures by techniques like conventional breeding. Although genetic engineering offers unlimited chances to get virus-resistance crops, its application to large scale has generated disgust for researches, government and people  . Genetics treatments, based on the use of resistant strains, seem ideal to control these disease, as option to decrease use of pesticides in crops. But, many kinds of reactions can be observed in a short or large time; partial resistance, tolerance and immunity to disease, are some examples. Two alternatives are proposed along this review to get news strategies in plant virus control: 1) the use of arbuscular mycorrhizal fungi, considered as a natural defense in plant besides enhancing yield and resistance  ; 2) the use of small molecules such as peptides with high specificity to viral target, and block in direct way of the process of replication or viral assembly. The aim of this review is to collect and disclose current strategies to develop plant viral control using peptides, based on techniques of peptidomics like tool for developing studies of direct molecule-molecule interaction. Table 1. Ranking with principal plant virus in regard to scientist and economy effect (data from MicrobiologyBytes). Several strategies had been described to get peptides in function microbial agent’s control, between them, peptides with target to bacterial membrane  or antifungal activity  . In some cases those molecules had gotten from specificity selection assays based in directly interaction between molecules as well as modification of bioactive peptides and de novo design reported previously in data base like PhytAMP  - , using combinatory chemistry and computational chemistry like tools to enhance the antimicrobial activity and develop and chose new peptides with a best biological activity  . Because, plant virus are particles formed of proteins like capsid (CP), nucleoproteins (N) and movement proteins (MP), we may think in the possibility to produced synthetic peptides or peptides derivate from hydrolysis of big proteins, which target, based via interaction peptide-viral protein or peptide-viral peptide assays, and propose the potential biological effect based on this interaction affinity system  . Those studies can use peptide libraries derivate of protein hydrolysis from plants or functional foods like casein (e.g.)  . Peptides libraries from plant proteins with antiviral activity is not explorer option yet, but peptides libraries from casein derivate has demonstrated that are able to decrease infection and symptoms in farms of salmons for IHNV (Infectious hematopoietic necrosis virus)  . Thus, a peptide derivate from FGF (Fibroblast Growth Factor) showed antiviral activity against an influenza virus (H5N1)  . Thus, we propose that peptides from protein plant hydrolysis could be a possible way to get peptide libraries with possible anti plant virus activities. The biopanning assay (selection through interaction) is performed fixing the target molecule (viral protein or viral peptide, viral antigens) on a solid surface; it could be performed in solution (like immunoprecipitation). The peptide libraries, either synthetics, derivate from protein hydrolysis or phagepeptides, after, they will be add onto viral antigen fixed on the surface of reaction system (microplate e.g. ), with the aim to let a random molecular interaction, in this way, only peptides with the best affinity to target, will allow interacting. The interaction time and incubation condition for this assay is at least 30 minutes to 1 hour in room temperature   - . After incubation time, is necessary to remove the peptides which did not interact or did not bind to the target. Binding peptides are eluted (if we performed the beads to collect the complex peptide-target, likewise immunoprecipitation). Eluted peptides should be analyzed using electrophoresis methods like Two-Dimensional gels (2D gels), or purified using chromatographic methods  . 2D gels allow separating in two parameters the complex mix or analyzed pure peptides or proteins, these parameters are 1) mass (Molecular Weight, MW) and 2) charge. Each band in the gel represent a peptide in the mix with itself features such as mass and charge. We could remove each band and confirm the MW by Mass Spectrometry (MS) method. Furthermore, MS can confirm whether peptide contain an S-S bond. In the study of peptides via MS, principal ionization method is MALDI and analyzed with TOF   - . MALDI (Matrix Assisted Laser Disruption Ionization) as well as ESI (Electro Spray Ionization) there are soft ionization non-molecule destructive methods, which let know the properties of peptides and proteins such as MW, pure, and S-S association   . 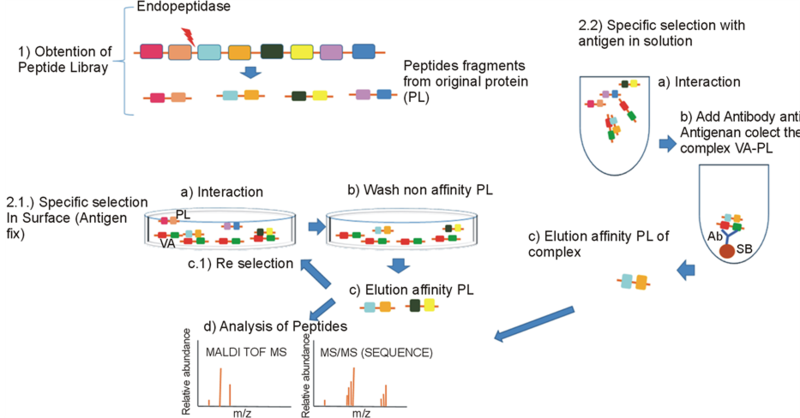 The MALDI-TOF MS, is a tool to know the MW of peptide selected against target. We could purified the mix of peptides in HPLC (these kind of peptides are not susceptible to degradation in high pressure indeed there are linear, small circular in Phagepeptides (no more 15 amino acids) or derivate from hydrolysis) coupled ESI MS/MS to get purified peptide and know the MW. Furthermore, we could know sequence de novo via trypsin digestion of each purified peptide or band in 2D gel, using CID MS/MS or get the fingerprint MALDI TOF/TOF  . We could analyze and purified via LC MS, the mix of selected peptides without passing 2D gels like shows in the general process in Figure 1. Once peptides sequences are known, the follow interest is to generate a 3D structure model of the peptide, this approach, will let us theoretical studies of the interaction dynamics of peptide-target and know the docking energy of the system in this interaction. These studies will help us to re-select peptides with the best probability of biological activity  . 3D peptide structure is performed by Molecular mechanics or Markov alphabet, first model is a singular mechanics balls-spring system using the real conformation state of the atoms in the peptide   . Markov alphabet is a alternative to propose a peptide structure using software which are based in modeling by comparison of the original peptide sequence with a algorithm structural alphabet formed by 27 structural letters  . There are software’s like PEP-FOLD who modeling peptides with this method (http://bioserv.rpbs.univ-paris-diderot.fr/PEP-FOLD/). Spectroscopic techniques like NMR is the way to know the real 3D structure of the peptide, lineal or cyclic  . Last method above mentioned, allows get more information about theoretical interactions between two molecules and predicts bioactivity for example in peptides. Figure 1. Process which described a general method to get peptide library derived from proteins and process to select peptides by biopanning assay, in surface and solution model. 1) Obtaining peptides from purified proteins using endopeptidases. 2.1) Peptides then are selected versus an antigen fixed to solid surface or 2.2) Peptides are selected in solution (the antigen is soluble in buffer), specific peptides (that bind to antigen) are recovered by wash with disruption buffer or by Antibodies (Ab) anti-viral antigen, respectively. Then is necessary elute those peptides from antigens and analyze pure of peptides by MS. PL: Pep-tide Library, VA: Viral Antigen, Ab: Antibody, SB: Sepharose Beads. Before evaluation of antiviral bioactivity of peptides is required to know the cytotoxicity activity in the plant, we can performed it experiment in protoplast model  with the aim to find the optimum peptide concentration (purified peptide or mix peptides) which are not interfere with plant growth. Starting nontoxic minimum concentration (NTC), add peptides to test viral infection model to find the minimum inhibitory concentration against the viral agent (MIC)  . We can choose the best activity and drive and match the biological activity with theoretical biochemical studies of the peptide, like chemistry structure. Above, we highlight the importance to find bioactive peptides in libraries of plant protein hydrolyzed, therefore, this requires of the selection specificity biopannings techniques in order to get the best peptide against virus. If we think get peptides derivate from this kind of libraries, the more logical is that those peptides are supplied via sprayed  or add to substrate in this case maybe those peptides become inductors of resistance genes (R)   . To achieve this treatment, we need to know the features of viral pathogenicity, since methods like sprayed could be more efficient in virus with replication and progeny develops in areas as mesophyll in leaves in genera like Cilevirus, Tobravirus, Tospovirus  - (see Table 2). In first proposal, arise the idea that peptides introduce to mesophyll of leaves through hydathodes and stomata, crossing cell wall and membrane, indeed we may think the chemistry composition of the peptides should contain some hydrophobic residues to cross the membrane and arrive to cytoplasm (the hydrophobicity of a peptide is not 100%, because some peptide molecules could acts in cytoplasm that is aqueous area), another idea is that some peptides can bind to DNA o RNA  if previously it were selected versus these targets. Protection against systemic virus replication can propose in addition of peptides to substrate, in this way the peptides could be absorbed by plant and arrive to infection sites in phloem, e.g. and finally be elicitors of R genes  . Those peptides may generate Systemic Induce Resistance (SIR) and turn on some pathways in the plant itself such as the case of salicylic acid   or turn on PR synthesis proteins likewise systemic inductors such as BTH (Benzothiadiazole) in geminivirus infections  , induce turn on of ethylene factor, which induce Programmed Cell Death (PCD) in response TYLCV infections   . The treatment proposes could be useful to virus which conducted Long-Distance-Movement (LDM), replication in Sieve Elements (SE)   , for example Begomovirus, Closterovirus, Cucumovirus, Tobamovirus  (see Table 2, Figure 3). Table 2. Summary principal importance virus’s which produce local infections (superficial in leaves and roots) and systemic infection (sieve elements). In regard to get treatments against systemic viral replication, some strategies had been developed; The form to achieve this aim, is through in plant synthesis of peptides (transgenic plants) derivate from antigenic regions of viral proteins such as CP, MP and Rep  , in this way, plant will turn on the immune system response against virus, like MAMP’s trigger immunity   . Another way to achieve this goal is to develop a screening in live system of peptide libraries which interacts and bind with some viral target, commonly using a yeast system (yeast two-hybrid interaction assay  - ). The basis for this technique is induce the direct interaction through peptide target (viral target) attachment region to DNA (DBD, DNA binding domain) in promoter of reporter selection gen, with, different peptides attachments (each peptide in a plasmid) to AD (Activation Domain in RNA polymerase binding site). In normal conditions this regions interacts and their interaction becomes to up-stream transcription of the gene, see Figure 2. This fact, was used as basis of the method for adding peptides from a libraries to AD region and the targets or viral target in the DBD region, if both sequences are able to interacts, these will conduce to closer the DBD and AD regions to drive transcription of the reporter gene. The transcription of reporter gene, leads up to believe that both sequence, target and peptide, are able to bind and is possible to use like bioactive peptide against target, this kind of peptides are called peptides aptamers  . The select peptides are after cloning in plants (transgenic plants). Reports on peptides aptamers with antiviral activity are based in the interaction of peptides derivates of common binding microdomain in N protein of Tosporvirus (TSWV, TCSV, GRSV, INSV and SYSV) as peptides targets, and a library of peptides derivates from other places in N protein of Tospovirus. Results show antiviral activity in Nicotiana benthamiana transgenic plants, peptides that closers interaction, decrease symptoms and viral RNA  . In case of systemic virus, some more important: geminivirus (TYLCV, TGMV), there are reports with peptide aptamers libraries with target to initiator replication proteins (AL1)  and Rep  , these proteins are significant because are essential to starting replication in several virus  . Both reports show that using a N. benthamiana transgenic model, containing aptamers peptides with previously screening in YTH, decrease the symptom and DNA level (see Figure 3). Once established the peptides aptamers library with best biological activity, we can carry out computational studies to confirm the biological dynamics of peptide and suggest modification to enhance the antiviral activity. These kinds of peptides are able to control localized and systemic virus infection in plants like above mention. Although the system is required in transgenic plants, there are not more studies in which peptides aptamers shows disturb plant metabolism. Results with experimental crop field studies are not reported, yet. The best nutritional source in plant is the soil. Is also source of pathogen microbe as fungi, bacterial, nematodes and virus. However, there are some microbe groups which are associated with plant roots or live near plant, this sometimes is an advantage in plant because this microbe group yield antimicrobial compounds against plant pathogens. Especially in plant virus, had been described bacteria such as Pseudomonas chlororaphis O6 and fungus as Trichodermapseudokoningii SMP2, Spedonium (Apiocrea, sexual phase), Boletus sp.     . Their populations of these microbes are principally in soil, and can relate with plants   . They produce peptides, with difference in generic pathway, and structural, and they plays in Systemic Induced Resistance (SIR), allowing the antiviral response. Figure 2. Yeast two-hybrid interaction assay. 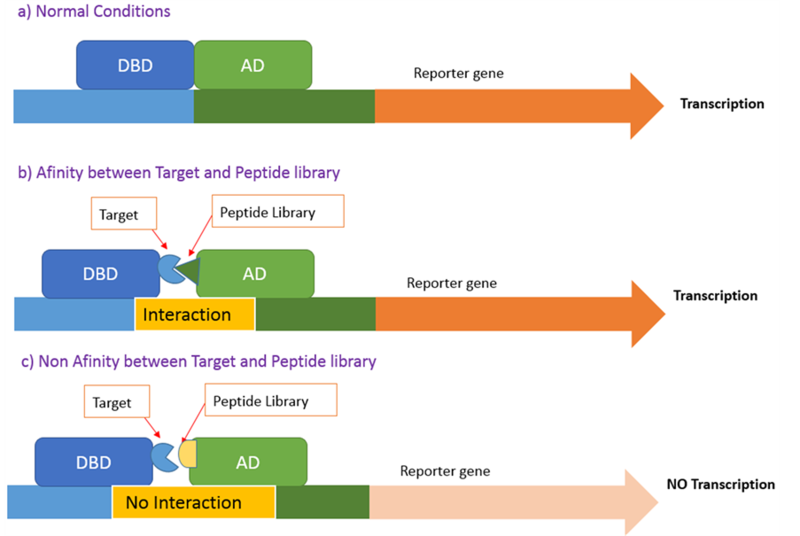 In normal conditions DBD region and AD are closer to let transcription of gen (a); If viral target coupled to DBD region and peptide from libraries coupled to AD region are able to binding, they closer interaction of DBD-AD and let the transcription of reporter gene (b); If not affinity between target and peptide from library the closer of DBD and AD does not occur, and does not transcription of reporter gene (c). DBD: DNA binding domain, AD: Activation domain. Experiments shows inoculated plants with P. chlororaphis O6 enable the plant develop resistance against Cucumber mosaic virus (CMV) in Nicotianatabaccum  . Subsequently Park Y.J. and collaborators, 2012 performed a resistance model with P. chlororaphis O6 in tobacco plants infected with TMV, the goal of these experiments were the purification of the active compound which induce SIR against TMV, researchers found in aqueous extract a cyclic peptide, this molecule consist by 7 amino acids and was analyzed by ESI-Q-TOF MS and NMR to structural studies. Pure peptide called “Peptamine” was assayed in tobacco plants TMV infected, peptide was add to plant through spray on the leaves, results showed antiviral activity likewise model only P. chlororaphis in substrate  . There are other peptide group comprise by non-proteinogenic amino acids called Peptaibols, they are formed with N terminal with acetilation and C terminal amino alcohol, the principal amino acids are α-aminoisobutiric (Aib) and Isovaline (Iva). Biological activity has broad spectrum against gram positive bacteria, and fungal  . However there are 3 kind of peptaibols with antiviral activity in plants such as 1) Chryospermins B and D, its produced Apiocrea Chrysoperma  . 2) Peptavirins A and B, them produced by Spedonium (Apiocreasp 14T). Both groups of pure peptaibols have showed resistance against TMV in tobacco plants  . 3) Trichokonins, produced in Trichoderma pseudokoningii SMP2, were purified and tested in tobacco plants infected with TMV, this peptaibol induced the SIR and decrease severe virus infection in concentration of 100 nM, it was showing decrease of 60% in viral RNA, as well as decline in symptoms severity. Other important date in the experiment is the test of Reactive Oxygen Species (ROS) production such as H2O2 and and phenolic compounds showed enhanced the production as well as the ROS enzymes in tobacco leaves; these dates suggest that peptaibols are peptides which acts like SIR elicitors  , see Figure 3. Figure 3. A general scheme of possible antiviral activity mechanism using peptides is shown. Peptides from libraries (PL/D) (derivate from plant proteins, phagedisplay, synthetics) with specific selection against viral targets such Coat Protein (CP), Movement Protein (MP) or Replicase (Rep); are sprayed on leaves and these come into cell, in cell they can bind to specific target and block replication of Viral Nucleic Acid (Viral NA) and block other process such as transcription of other viral proteins, both bind to MP and block the movement of viral nucleic acids and virion into cell-cell (C-CM) through Plasmodesmata (PLDM), having consequently decrease in Long Distal Movement (LDM) and systemic infection. Peptides aptamers (PLY) in transgenic plants (Plas) are able to develop a response likewise described above. In case of peptaibols (PAIB), they are synthesize by fungal as Trichoderma or cyclic peptides by P. chlororaphis O6 in soil, plant absorbs and in this way will enhance Resistance genes (R genes) and pathways like Salicylic Acid (SA) and Ethylene (ET) consequently enhance of Reactive Oxigen Species (ROS) and phenolic compounds, decrease the synthesis of viral nucleic assay and the systemic virus and localized. strategies to enhance the protection against virus; tools like MALDI-TOF and computational chemistry are options that allow us to research direct molecular interactions into small molecules with viral particles and to think in a possible direct treatment against plant virus. However studies in crops are not developed yet, it is necessary to motive researches in the study of crop fields and monitor in vivo protection. This work also presents an alternative to the use of transgenic plants, exploring the use of peptide libraries derivates from plant or animal proteins or other sources. Patino, M.R., Hernández, P. and Suárez, R. (1981) Sanidad Vegetal. Pueblo y Educación, Ministerio de Educación, Cuba. Vidales, F.J.A. and Alcantar, R.J.J. (1989) Ataque de la virosis durante la floración y su efecto sobre la producción de melón (Cucumismelo L.). Memories of XVI National Congress of Mexican Plant Pathology Society. Gergerich, R.C. and Dolja, V.V. (2006) Introduction to Plant Viruses, the Invisible Foe. The Plant Health Instructor. Hull, R. (2002) Matthews’ Plant Virology. 4th Edition, Academic Press, San Diego. International Committee on Taxonomy of Viruses (2013) Virus Taxonomy Assignments. González, L.R. and Delgadillo, S.F. (1989) Inclusiones producidas por algunos virus fitopatógenos. Memories of XVI National Congress of Mexican Plant Pathology Society. Maffei, G., Miozzi, L., Fiorilli, V., Novero, M., Lanfranco, L. and Accotto, G.P. (2013) The Arbuscular Mycorrhizal Symbiosis Attenuates Symptom Severity and Reduces Virus Concentration in Tomato Infected by Tomato Yellow Leaf Curl Sardinia Virus (TYLCSV). Mycorrhiza, 24, 179-186. Zeitler, B., Herrera Diaz, A., Dangel, A., Thellmann, M., Meyer, H., et al. (2013) De-Novo Design of Antimicrobial Peptides for Plant Protection. PLoS ONE, 8, e71687. López-García, B., San Segundo, B. and Coca. M. (2012) Antimicrobial Peptides as a Promising Alternative for Plant Disease Protection. Small Wonders: Peptides for Disease Control, 263-294. Rodríguez Saint-Jean, S., De las Heras, A., Carrillo, W., Recio, I., Ortiz-Delgado, J.B., Ramos, M., Gomez-Ruiz, J.A., Sarasquete, C. and Pérez-Prieto, S.I. (2013) Antiviral Activity of Casein and αs2 Casein Hydrolysates against the Infectious Haematopoietic Necrosis Virus, a Rhabdovirus from Salmonid Fish. Journal of Fish Diseases, 36, 467-481. Liao, Y., Alvarado, R., Phinney, B. and Lonnerdal, B. (2011) Proteomic Characterization of Specific Minor Proteins in the Human Milk Casein Fraction. Journal of Proteome Research, 10, 5409-5415. Kathleen, L., Wei, J. and Siuzdak, G. (2006) Matrix-Assisted Laser Desorption/Ionization Mass Spectrometry in Peptide and Protein Analysis. In: Meyers, R.A., Ed., Peptides and Proteins, Encyclopedia of Analytical Chemistry, 5880-5894. Cramer, C.J. (2004) Essential of Computational Chemistry. Theories and Models. 2nd Edition, Wiley, Hoboken. Luo, Y., Zhang, D.D., Dong, X.W., Zhao, P.B., Chen, L.L., Song, X.Y., Wang, X.J., Chen, X.L., Shi, M. and Zhang, Y.Z. (2010) Antimicrobial Peptaibols Induce Defense Responses and Systemic Resistance in Tobacco against Tobacco Mosaic Virus. FEMS Microbiology Letters, 313, 120-126. Manhy, B.W. and Van Regenmortel, H.V. (2010) Desk Encyclopedia of Plant and Fungal Virology. Academic Press, New York. Sastry, K.S. (2013) Plant Virus and Viroid Diseases in the Tropics, Vol. 2: Epidemiology and Management. Springer, Berlin. Chen, T.Z., Lv, Y.D., Zhao, T.M., Li, N., Yang, Y.W., Yu, W.G., He, X., Liu, T.L. and Zhang, B.L. (2013) Comparative Transcriptome Profiling of a Resistant vs. Susceptible Tomato (Solanum lycopersicum) Cultivar in Response to Infection by Tomato Yellow Leaf Curl Virus. PLoS ONE, 8, e80816. Mase, K., Ishihama, N., Mori, H., Takahashi, H., Kaminaka, H., Kodama, M. and Yoshioka, H. (2013) Ethylene-Responsive AP2/ERF Transcription Factor MACD1 Participates in Phytotoxin-Triggered Programmed Cell Death. Molecular Plant-Microbe Interactions, 26, 868-879. Hanley-Bowdoin, L., Bejarano, E.R., Robertson, D. and Mansoor, S. (2013) Geminiviruses: Masters at Redirecting and Reprogramming Plant Processes. Nature Reviews Microbiology, 11,777-788. Ghanim, M., Brumin, M. and Popovski, S. (2009) A Simple, Rapid and Inexpensive Method for Localization of Tomato Yellow Leaf Curl Virus and Potato Leafroll Virus in Plant and Insect Vectors. Journal of Virological Methods, 159, 311-314. Rudolph, C., Schreier, P.H. and Uhrig, J.F. (2003) Peptide-Mediated Broad-Spectrum Plant Resistance to Tospoviruses. Proceedings of the National Academy of Sciences of the United States of America, 100, 4429-4434. Mascini, M., Palchetti, I. and Tombelli, S. (2012) Nucleic Acid and Peptide Aptamers: Fundamentals and Bioanalytical Aspects. Angewandte Chemie International Edition, 51, 1316-1332. Campos Olivas, R., Louis, J.M., Clerot, D., Gronenborn, B. and Gronenborn, A.M. (2002) The Structure of a Replication Initiator Unites Diverse Aspects of Nucleic Acid Metabolism. Proceedings of the National Academy of Sciences of the United States of America, 99, 1310-1315. Kim, Y.H., Yeo, W.H., Kim, Y.S., Chae, S.Y. and Kim, K.S. (2000) Antiviral Activity of Antibiotic Peptaibols, Chrysospermins B and D, Produced by Apiocreasp. 14T against TMV Infection. Journal of Microbiology and Biotechnology, 10, 522-528. Kang, B.R., Han, S.H., Zdor, R.E., Anderson, A.J., Spensor, M., Yang, K.Y., Kim, Y.H., Lee, M.C., Cho, B.H. and Kim, Y.C. (2007) Inhibition of Seed Germination and Induction of Systemic Disease Resistance by Pseudomonas chlororaphis O6 Require Phenazine Production Regulated by the Global Regulator, GacS. Journal of Microbiology and Biotechnology, 17, 586-593. Howell, C.R. (2003) Mechanisms Employed by Trichoderma Species in the Biological Control of Plant Diseases: The History and Evolution of Current Concepts. Plant Disease, 87, 4-10.